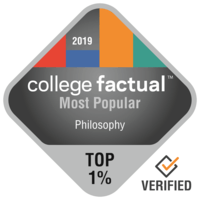 Entry into the Ph.D. program in philosophy is highly competitive, and only the best students are selected. For this reason, you can be sure that courses taught by grad students are top quality, too. Although everyone might, at one time, discuss these things, philosophical exploration is done with the rigor of analytic thinking that rises above casual discussions based on mere opinion. In scrutinizing the potential answers to these questions, students of philosophy learn the skills of critical thinking, problem-solving, conceptual analysis and argumentation. Philosophy students know how to look at the big picture, stay open-minded, and always look for the truth. “Do the practices of philosophy change, and do they improve?"